PEACE BE WITH YOU and WELCOME TO OUR MONASTERY ! I am Father Superior Peter and I would like to tell you about our monastery. The first historical facts relating to our monastery date back to 1688 when the elderly monk Alexander and the other monks asked Metropolitan Savvaty for his permission to built a brick Church in honour of St. John the Forerunner.Most likely before it there had existed some wooden church bearing the same name so the foundation of the monastery originated in an earlier period. At the end of the 17th century Astrakhan was rather a large city the population of which was constantly increasing thanks to emigrants from Central Russia and the intake of foreigners.At that time Astrakhan consisted of three fortified areas: the Kremlin, White Town and Earthen Town. Earthern Town comprised a number of slobodas, some of which being situated on the southern bank of the River Kutum. It is there , outside the limits of Earthen Town , on the spit of the Rivers Kutum and Lukovka that our monastery was founded. Its more than three hundred-year-old history is reversals of fortune of its monks, elder monks, Fathers Superior, its churches and buildings as well as the history of Astrakhan and at times the history of Russia. Thus in the spring of 1706 when Astrakhan was captured by rebellious strelets the monastery became a reliable support for governmental troops headed by Field-marshal Sheremetev who arrived from Moscow as well as for Metropolitan Sampson and a number of distinguished Astrakhanians. During the years of the Soviet power the monastery shared the tragic fate of numbers and numbers of other Russian monasteries. Most of its churches and buildings were either pulled off or taken away .The monastery itself was closed in 1929, the monks and the other clerics were either killed or driven out. Worthy mentioning here is Bishop Leonty who was arrested in his cell and shot on July 23, 1919 together with Astrakhan Archibishop Mitrophan . 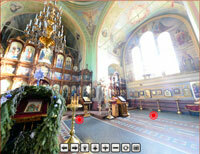 Our three-chapel cathedral was used by ZAGOTZERNO as a storehouse for many years. The cathedral was started in 1895 to replace two wooden churches: the Church of the Meeting of Our Lord (the Presentation - Sretenje) (built in 1714) and the Ñhurch of St. John the Forerunner (built in 1780). The newly built cathedral was consecrated to Our Lord's Sretenje. It had two side-chapels: of the icon of the Most Holy Theotokos ( The Joy of All Who Sorrow ) and of the Holy Archbishop Tikhon Zadonsky. Historically there used to be two more churches in the monastery: one placed on the first tier of the monastery Bell tower and consecrated to Holy Martyr John the Warrior and the other - the Ñhurch of Nativity of St John the Forerunner. They were pulled down in the 1920s. The cathedral, you can see in the monastery now, acquired its present name-the Cathedral of Beheading of St John the Forerunner - in 1989 after its return to the Orthodox Church. Since then it has served as the monastery cathedral. In 1995 the right side-chapel of the cathedral was consecrated to the icon of The Virgin of Iversk and the left chapel to the Holy Archbishop Tikhon Zadonsky. The cathedral dominates the complex of the monastery. It has a cruciform plan: to its central rectangular part like the wings of the cross there adjoins the altar from the eastern side and from the western, northern , and southern sides the central and side-chapels. The cathedral is distinguished for its festive air and the wealth of cupolas which, like tongues of flame, soar upwards with its eight-pointed crosses. These five cupolas rest on two rows of kokoshniks, embracing the cathedral from all sides. 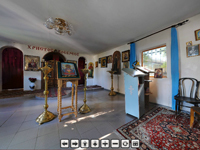 All the three side-chapels have the same rectangular shape and are crowned with semi-circular tops except for the central one which has a special extention at the entrance decorated with a tent-shaped roof rooted in Russian folk art, and surmounted with a miniature onion-shape dome and a cross.The abundunce of the gilded cupolas and the joyful combination of colours lend the cathedral its light and graceful look. Originally the cathedral was not very spacious inside but its inner space has been enlarged recently owing to the overhead choir built a few years ago. Monasteries have always been held with love and respect in Russia and people have always made donations to them. Ours is not an exception. For its more than three-century history it has had its true benefactors and benefactresses since the first days of its existence. The first stone cathedral on the territory of the monastery was built on Metropolitan Savvaty's private donations. In 1714 a wooden Church of Our Lord's Sretenje was erected there on the money of Afanasy Meshcherykov, a famous Astrakhan tax farmer, left to the monastery according to his will. And at present as ever it would be required not a single page to list all those thanks to whom we can have our fanciful looking cathedral, its gilded cupolas, its iconostasus, its icons and wall paintings, our library, classrooms as well as all the other premises . Monks are called Angels on Earth. They are sacrifices the society brings to God to defend itself. They are light to laypeople. The number of monks in the monastery has never been great. In 1692 after a terrible plague epidemic only two monks survived, all the rest were dead, elder monk Alexader among them. In 1720s the conflict between Bishop Ioakim and Astrakhan Governor Volynsky resulted in closing the monastery, all the monks being transferred to another monastery. At the beginning of the 20th century eight monks, Father Superior, five monks and four novices dwelt in the monastery. Today we have got 12 monks and 4 novices. Every monastery has its own monastic rule. According to it all our monks dwell in their cells to the right of the cathedral and in the block situated in the eastern part of the monastery.The block was built in 2001. The present-day stone cells as well as the two-storey block of Father Superior were built in 1895 to replace the wooden ones. The south- eastern corner of the block of Father Superior is surmounted with a small turret having a figure of an angel trumpeting. It is among the oldest buildings of the monastery. The same turrets used to surmount the monastry fence at its four corners. 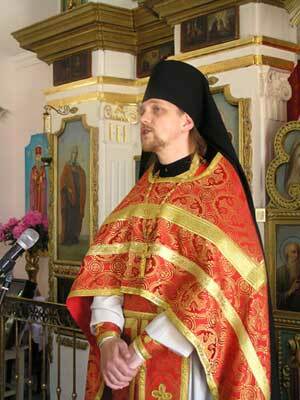 Monasteries are spiritual stronghold of Russia and they have always carried out great church and educational work. The first school in the monastery was opened in 1730. It was a school for the Kalmyks where children from poor families were also taught. In 1876 there started regular school training and in 1892 a parish school began its work. Nowadays about 200 boys and girls attend classes at the monastery Sunday school. "The time to gather stones" and "the time to speak" have come. We are optimistic about our future. Little by little the monastery is reverting its bygone significance in the life of our town. More and more people including young people and young families come to our services and render a disinterested assistance to the monastery in solving its every day problems. Visitig a monastery is the best way to join in Orthodoxy. Come and let the trumpeting angel call you up to the great Cristian tradition the stronghold of which in Astrakhan Region is our monastery.